Professionally designed and Search Engine Optimized Free Blogger Templates are quick and efficient way to attract more users to your blogs. There are several templates available in the internet for free download. But before downloading those, here we will see what are the important features must a template have? Moreover the Template must have been built up on the robust foundation of Html, Css, JQuery, which is exactly what search engine looks for. Even though it is for free, you must check that the templates are Licensed under Creative Commons which allows the templates to be used both personally and commercially. Let’s see few of those effective templates that you can download for free and make use of it effectively. 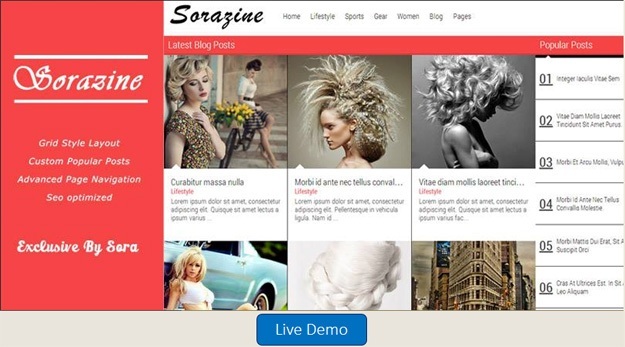 It is a responsive, 3 columns blogger templates for the technology blogs. It was released on April 20, 2014. It has 468×60 Header Banner, JQuery slider, Drop down menus, Tabbed widget and more. To know more about this in detail, you can visit the following site which guides you how to install this template. Provides optimal viewing experience across wide ranges of devices from desktop computers to mobiles. It has attractive slide show option which allows you to show your post with the help of these slides. Your website when making use of this template will be more beautiful with its attractive fonts and colors. It has extraordinary typography by giving pleasant feeling for the readers. This is a template for the health and fitness blogs. This template has orange background and with menu under the title. Though it has menu control in common you can also add any custom links to the site. Basic Bold is a magazine Blogger template with blue background and black menu under the title. It has left and right side bars and has 1 menu for the page. Has similar feature as above template “Health living”. For the geek lovers, here comes the Mashable like Blogger template. It is ready made template which means that images, texts, are convenient for the users. It has attractive social media icons on the top left just like mashable. You can also customize drop down menu according your taste. Thus, you would have got a list of useful SEO Optimized Templates for bloggers which can be used effectively to turn your blogs into a attractive one. Using unique template design will take your blog to the next level. The templates which has been listed has its premium qualities and customization features. Hope you would have enjoyed the post! Subscribe Here to get blogging updates within your inbox.